The European Commission and the Member States are mandated by the regulations that lay down the rules for the European Structural and Investment Funds (ESIF), Horizon 2020, and other EU programmes directly managed by the Commission in the areas of research, innovation and competitiveness – in particular COSME, Erasmus+, Creative Europe, European Union Programme for Employment and Social Innovation (“EaSI”)and the digital services part of the Connecting Europe Facility- to ensure coordination, synergies and complementarities. 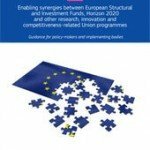 Although there has been a substantial increase in the budget of Horizon 2020 (almost EUR 80 billion) compared to the previous research framework programmes and although there has been a steep increase of the innovation and competitiveness-related budgets under cohesion policy over the past decade, it is of utmost importance to ensure an optimal synergy between the funds to face the ever increasing competitive pressure from global markets and maximise impact and efficiency of public funding. The European Parliament and Council made it clear that this approach is no more a “nice to have” but a “need to implement”. This political will needs to permeate all layers of stakeholders, at Member State level as well as Commission services level, including intermediaries and facilitators’ networks. To achieve this, it is crucial to align strategies and implementation modalities and complement existing and future roadmaps. However, translating this new reality will be a learning process, given that ESIF implementation is under Member States’ shared management rules while Horizon 2020, COSME, Erasmus +, etc. support is allocated at EU level (directly or indirectly by the Commission). A first effort lies in making strategic choices and planning on the side of the regions and Member States, i.e. to foster excellence in the smart specialisation areas. On the Horizon 2020 side, it consists of implementing the programmes in a synergies-friendly manner in terms of raising awareness, providing information, engaging in communication campaigns, and connecting National Contact Points (NCP) as much as possible to national and regional ESIF policy makers and managing authorities.